One of the sculptures, the life-sized form of a woman, is based on Dickinson’s poem “Take all away from me, but leave me ecstasy.” When I saw it, I thought about Emily’s poetry that was such a radical departure from the conventional life she lived and how the art form I was viewing really did come alive and evoke a feeling of rapture as represented through the form, inspired by the language in the poem. The only difference between the two artists, Dill and Dickinson, is in the amount of recognition accorded the artists for their work. 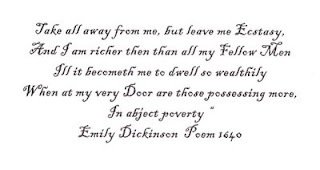 Emily died, with only seven of her 2,000 poems appearing in print during her life time and was unrecognized for her creative efforts (although her posthumous fame is great). In contrast, Dill has, in her fifties, received tremendous recognition -- a list of her exhibits fill several pages, and she has been featured at the George Adams Gallery, Metropolitan Museum of Art, Whitney Museum, the Museum of Modern Art, the Chicago Cultural Center, the Contemporary Museum of Honolulu, the National Museum of Women in the Arts in Washington, D.C., and many others. She has been awarded numerous grants, including a National Endowment for the Arts Sculpture Fellowship. I stood, transfixed, before Dill’s “Dress of War and Sorrow,” a silver and black metal foil dress, high necked, tight waisted, with a flowing train and actually felt the angst of futile battles. Bronzes, wire pieces, fabric and paper forms that sometimes address social and spiritual issues highlight the exhibit. Dill uses thread, wire, paper to construct tapestries, and the effect is inventive and unexpected, much like Dickinson’s poetry…or Kafka’s writings. We saw thirty-four pieces of art in the large scale exhibit and also watched a 50-minute film featuring Dill in her workshop, narrating the film. “I Heard A Voice” is reputed to be a “first of its kind” to exhibit in the 57-year history of Hunter Museum and is also a first for the museum in that it will sponsor a tour of the exhibit, along with George Adams Gallery in New York. Dill lives and works in Brooklyn, New York; her work appears at the George Adams Gallery in New York and Arthur Roger Gallery in New Orleans. As I’m not a trained art critic, I’m sure this is a slight review of the artist’s work, but perhaps it will titillate art lovers in the area to take a look. Dill’s multi-layered work, rendered in diverse materials, is a visual art experience that transcends conventional figures and forms and evokes much contemplation. For the last two mornings, I’ve awakened to the sound of wind keening underneath the eaves of the cottage -- a sound that evokes strong images of all the big winds I’ve encountered during my lifetime. On The Mountain here at Sewanee, I hear people talking about the ferocity of wind that occurs on the bluffs where many have built homes to enjoy the view of the valley below. I wonder how many of them have really experienced the destruction that bigger winds bring. I’ve heard the howl of Louisiana hurricane winds traveling at a rate of 175 mph, have experienced dust storms that blew sand under the door sills, driven by wind in El Paso, Texas and endured the “Nor’Easters” in Limestone Maine during a winter sojourn in New England. Then, there are the hot winds that blew during blinding dust storms in southern Iran where I lived for two years… and the great gales of the Santa Ana that blew over the desert in Palmdale, California where I visited my daughter every summer for 20 years. In an article in “Science Daily,” I discovered the fact that easterly trade winds in the Sahara desert carry great clouds of dust across the Atlantic Ocean to the Caribbean and Americas and bring with them microbes which cause respiratory problems, as nearby as Florida. These microbes pose a health risk in the entire western Atlantic region, and they’re borne on the mouth of the winds from Africa. The Big Wind, a hurricane, blowing hard and steady, figures in two Young Adult narratives I’ve written – THE KAJUN KWEEN and MARTIN FINDS HIS TOTEM. Wind takes first place in MARTIN FINDS HIS TOTEM in the opening paragraph: “The wind howling under the eaves and ramming the old cabin in hard waves woke me up. The steady push of noise made my stomach tingle and my throat close up. I swallowed hard, knowing that the sound of the angry wind wasn’t going to stop – it was a full-blown hurricane…” In the KAJUN KWEEN, comic book heroine, Petite Marie Melancon, (shown in the illustration above, rendered by Paul Schexnayder) challenges the Big Wind by tying herself to a tree in the middle of a hurricane. Fortunately, she’s coaxed indoors by her Uncle Ti’ Joe before the storm gales take her away. When Emily Dickinson wrote a poem about the month of March, she said, “A light exists in Spring/not present on the year/at any other period,/When March is scarcely here…” I understand her lines, or rather, for me the light on The Mountain at Sewanee in March seems to be almost filtered. I can identify with the poetess’s lines on days when the sky is the color of gunmetal, a dull and inertia-producing kind of light prevailing, especially when temperatures hover in the 50’s and 60’s, and, to my Louisiana-thickened blood, feels like 40 degree temps. However, there is a brightly-colored plant that illuminates the landscape “not present” in such brilliance during other times of the year – the vibrant yellow forsythia. Most of the plants grow wildly in all directions because gardeners prefer not to prune them into a more conforming shape. Their yellow blossoms grow on arching branches and actually precede their leaves, and they really put on a show. Forsythia is not native to America, but was introduced to this country from the Orient approximately 100 years ago. I see them putting on their yellow bell-shaped flower display in yards and woods, often forming boundaries between adjoining yards and sometimes serving as privacy fences. Plant literature reveals that forsythia grow well in places where the winter temps don’t drop below -10 degrees F., so they abound here on The Mountain and can survive to the age of 60 if they don’t have too many gray days such as the ones we’ve been experiencing. Actually, Amherst, MA (where Emily Dickinson was born) may have ushered in more light than we see here in late March, for Emily also exclaimed about the month, “Dear March, come in!/How glad I am!/…” whereas, I’m more inclined to look for April to banish the dull gray afternoons! against this weather of parsimony. for the trees to open their eyes. There they are – hanging above my desk – two religious icons, one of Christ speaking to Scribes, possibly Pharisees. However, a few of those Scribes depicted may have written about people with different political and religious viewpoints, perhaps like those of my friend who gave me the icon. On the back of this icon, in the small, precise handwriting that was Fr. John Moloney’s, is the message: “From an iconographer to an icon. Love, John.” It’s possibly the most gracious tribute anyone ever gave me. John died two evenings ago after fighting an incredible battle with cancer, and this moment, I am filled with rich memories of him copying icons, an artist creating pictures of how God lived and illuminated the lives of humans. Fr. John Moloney came to the Church of the Epiphany in New Iberia in the late 80’s as a deacon about to begin his vocation as an Episcopal priest and so inured himself to parishioners with his passionate preaching, they circulated a petition to call him as their priest (even though this was a “no-no” for a deacon to become a priest at the church in which he had served as a member of the Holy Order of Deacons). He remained a passionate preacher and one who was devoted to outreach, and distinguished himself in many ways, but most particularly during Hurricane Andrew when he obtained a hefty grant from the Presiding Bishop to provide hurricane relief throughout Iberia Parish. He also established a chapter of Habitat for Humanity to aid people in rebuilding and constructing homes they had lost in the disaster. A gourmet chef, John ministered to the sick and elderly by bringing them bread and wine in his Communion kit and... a tantalizing Cajun dish he had concocted in plastic containers. He believed that food, along with the Eucharist, brought joie de vivre into the lives of those who suffered. Recently, friends and I were discussing the major themes of sermons delivered by the various priests at Epiphany during our time there (which spans approximately 50 years of preaching) and decided that Fr. John’s theme was “Lord, turn my life upside down, turn your lives upside down.” A few weeks ago, before I left Louisiana, I visited with him and reminded him of this message. He was lying abed in his home in Baton Rouge and smiled widely as though he wasn’t really sorry he had preached those words so many times. Armed with the Cross, he was always going out to the disenfranchised – to those who were poor… or ignored… or outright rejected. 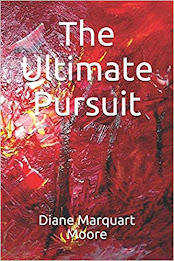 Yet, he craved the time and the space for contemplation and was eventually commissioned by Bishop Robert Hargrove to set up a Spirituality Center at Camp Hardtner near Pollock, Louisiana where he could provide spiritual direction and retreats for those who sought deeper spirituality in their lives. Unfortunately, not enough support for the Center emerged, and he was called to become the Archdeacon for the Diocese of Western Louisiana where he served as the major administrative support for the Bishop’s work. It is John who inspired me to become a deacon, even when the Diaconate was temporarily suspended in the Diocese. He was a presenter at my ordination, later recommending me for the office of Dean of the Bishop’s School South, to represent the Diocese on the Board of Trustees at Episcopal Theological Seminary of the Southwest and to become involved in diaconal formation. He always had his feet at my back, gently prodding me to enter another phase of service in the Diocese. After resigning as Archdeacon of the Diocese of Western Louisiana, John became the rector of a large church in Memphis, Tennessee and devoted his efforts to doing those things Christ calls us to do that most of us would rather let go undone. He worked while praying and prayed while working, seeking out people who needed His love to transform their lives and centering his vocation on charity, rather than on personal piety. He had just begun mission and outreach work with St. James Episcopal Church in Baton Rouge, Louisiana when he was suddenly diagnosed with cancer of the colon, then cancer of the liver, and waged a courageous battle while enduring intense suffering. I truly feel that wherever John was sent in his vocation, his conviction was that God had sent him to turn some place or some congregation upside down. He was always creating his own send-offs – “Ite missa est” (“Go now”), knowing that those he commissioned made out well in whatever he had sent them to do – to love, heal, serve, turn their lives and those of others upside down. For several days after arriving here, I longed for the Spring I had left behind in Teche country and scurried to the shelves in my bedroom to read some of the snippets that I had written about Spring flowers in my garden in New Iberia. It’s from the chapbook, JUST PASSING THROUGH, and I share it with you…particularly my good friends in Acadiana who revel in the lush Springs that occur in that part of the world. to seed a carnation incarnate. is thankful for its silence. because we consume all we see. Yesterday, temps on The Mountain hovered near 40 degrees, and a fine mist and rain fell most of the day. It could have been a gloomy time, but our long-time friend, Anne Boykin, invited us to have lunch with her in Tracy City to brighten the day. Tracy City is a small town at the end of a road that winds through the hills northeast of Sewanee and has lately become noted for its restaurant, “Tea On the Mountain.” The building that houses this eating place is a nondescript, white-plastered building with scant windows, and when we drove up and looked at the bland exterior, I thought “uh-oh.” However, we opened the door and stepped into a fine dining facility -- white linen table cloths, fine china and silver atop antique tables scattered through several rooms, the walls lined with regional art and sets of fine china displayed on tables in every room – some sets for sale, some on exhibit only. We were served hot tea as soon as we sat down and given a menu that featured a range of entrees from crab cakes to quiche, with accompanying green salad and French bread. The appetizer was an almond-stuffed date wrapped with bacon, and the piece de resistance was a tiny chess pie for dessert. The owner came to our table and told us a story about the pie’s name being derived from the wife of Andrew Jackson referring, off-handedly, to her dessert as “jes pie.” “Tea on the Mountain” was a real dining experience on a cold March day in the hills of Tennessee, and the hospitality within the square white building made me ashamed that I had misjudged the restaurant on the basis of its exterior. Anne, who is our food guide on The Mountain, could open a restaurant at Sewanee had she an envee to do so, which she doesn’t have. She’s one of Sewanee’s finest chefs and a model of southern hospitality. I’ve put my feet under her table many times, enjoying delectable dishes prepared according to directions from neatly typed recipes passed on to Anne by her mother, who lived on a huge farm near Murfreesboro. When Anne and Elmer (former rector of Epiphany in New Iberia) lived in New Iberia, Anne hosted weekly church luncheons and dinners in her home, even outdoor “feeds” in the rectory’s side yard, such as the one she hosted when I left New Iberia for our sojourn in Iran during the late 70’s. At 80, Anne says she has retired, but she’s noted for providing food and shelter for people who come to The Mountain for brief stays and find “no room at the Inn.” Last summer when a Vietnamese student graduated, he invited his family (who spoke no English) to the Commencement and searched vainly for rooms to accommodate them. Anne opened her home to them, and says they parleyed quite well without either speaking the other’s language. The Vietnamese family’s favorite meal while staying with Anne was breakfast, my favorite meal at her table. They were served a Tennessee farm breakfast, complete with tiny homemade biscuits, grits, sausage…the full complement of breakfast fare. I’ve threatened to publish the small book of Anne’s recipes taken from her mother’s repertoire, but she insists she has retired and her kitchen is closed –and she doesn’t want the publicity… until someone shows up and needs food and shelter, that is. One of the reasons we retired to The Mountain is that we anticipated everyone at Sewanee being as hospitable as Anne Boykin. However, she’s still undisputed #1 gracious hostess on The Mountain – or anywhere else she has lived in the South. We’ve returned to our cottage on The Mountain and, this morning, went out to St. Mary’s of Sewanee where we worship several mornings a week. Both my home and the convent have announced Spring in the yards where clusters of yellow and white daffodils that endured a hard winter this year have been emboldened to grow in blustery March. Trees look “like bare ruined choirs,” as the poetess Edna Millay wrote, and the rose garden at St. Mary’s is devoid of blooms. My own garden has become a place of dried brown stalks. However, during the past two days temps have risen to 70 degrees, and I anticipate more Spring foliage soon. I bring in handfuls of daffodils from my front lawn, which is really the woods, and the trumpet-like yellow flowers, clustered in a blue vase, light up the dining table. Even though daffodils show such spectacular beauty, all of the varieties contain an alkaloid poison in bulbs and leaves. The root of the flower was once used by Romans as an emollient, but florists today often complain of an eczema-like condition from handling daffodils. Breeders are currently working to create cultivars of daffodils in pink, rose, red, orange, and green tones which are bled from the more highly colored coronas onto perianth segments of white and yellow. The process produces enhanced coloration, but I prefer my woods-growing, “au naturel” varieties! (By the way, daffodils also smell wonderful). The photograph above is of a cluster of daffodils in my front yard here at Sewanee. When I spend part of the year in New Iberia, Louisiana, I meet twice a month with a group called The Fortnightly, with an accent on “THE” because this club is the mother Fortnightly that spawned at least 12 other Fortnightly branches in Acadiana. 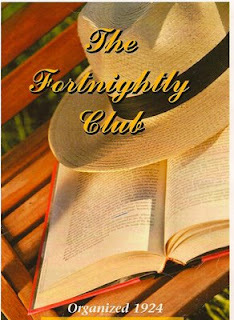 The Fortnightly is a literary club, and each member hostesses and presents a book review according to a chosen theme for at least one meeting per year. It’s a sprightly group of women in their sixth, seventh, and eighth decades who are omnivorous readers and, I learned just this year, who’re also skillful writers. This year’s program featured an autobiographical theme, and we enjoyed the memoirs of members, some of which had been written in a Creative Writing class sponsored by the Iberia Parish Library. This week, Claire Mire, who has a wonderful sense of humor, presented writings from several of her assignments for the Creative Writing class, the most notable one being on the subject of procrastination and another called “Reflections On A Song.” I asked Claire to make a copy of the assignments and mail them to me, which she did, and I’m presenting a few excerpts of her reflections for “A Words Worth” readers. This reading by Claire, delivered with a wry smile, caused one listener to declare about her writings: “Well, after all, she IS a Burke,” which, in New Iberia, translates to James Lee Burke, the best-selling author of detective fiction who calls New Iberia his home. Last week-end, I was catapulted “back in time” on a visit to Madisonville, Louisiana where my grandson Martin Romero works as a landscape architect. 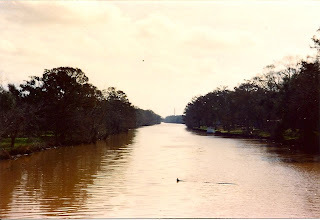 When I was a teen-ager, we sometimes visited this small community on the Tchefuncta River, and during the 50’s, it was just one short street that had a cluster of bars, restaurants, and a landing where we launched a boat for a ride on the river to view the mansions lining this waterway. Most of the homes were owned by New Orleanians who spent week-ends there during the summer months. We also enjoyed discovering wildlife in the old marshes nearby where we could watch an abundance of ospreys and other water birds. One of the highlights of the boat ride was sighting the venerable Tchefuncta River Lighthouse built in 1838 and destroyed during the Civil War, then rebuilt, to be destroyed partially again by Hurricanes Katrina and Rita. The lighthouse, an icon of the area and now an educational center, has again been restored and is managed by the Lake Pontchartrain Basin Maritime Museum. At one time, the famous Jahncke Shipyard, site of shipbuilding during WWII, occupied what is now part of the town. Today, Madisonville has become a bedroom community of New Orleans, Slidell, and other towns on the North Shore, with a burgeoning population, despite flooding of most of the town during Hurricane Katrina. New subdivisions showcasing handsome stucco and brick homes have sprung up within the few miles surrounding the town’s center, and my grandson and his wife, Kristin, are excited about becoming owners of one of them. My daughter, Stephanie, and I were fascinated with the old homes facing the river in the center of town, including several Greek Revival homes and two raised cottages. From their front porches, residents can view sailboats anchored at riverside, while gulls dip and swoop overhead, knowing that the swells of Lake Pontchartrain aren’t far away. However, Martin informed us that because of their close proximity to Lake Pontchartrain, these homes were hurricane targets as evidenced by the “For Sale” signs in their front yards, not to mention the astronomical prices posted for these disaster-prone residences. Madisonville’s biggest attractions are the restored Madisonville Lighthouse and the Lake Pontchartrain Basin Maritime Museum, and its biggest event is the Wooden Boat Festival held in September. I was born, 30 miles north of this town in Franklinton, Louisiana, which is inland redneck country, and the week-ends we spent at barbecues and picnics in Fountainbleau and Mandeville Parks near Madisonville were part of the good life in the fifties. I am now writing about water because I will travel to land-locked terrain at Sewanee, TN this week for a six-month stay and realize how much I missed the sight of rippling waves last summer when I’d exclaim at the sight of the smallest creek that I came upon while out hiking the hills around Sewanee. Tip to the Tourist Who Looks for Good Food in Madisonville: Seafood dishes abound in restaurants in and around Madisonville and are superb... but you may be disappointed with other fare.